Editor’s note: Schools are working with Google for Education Premier Partners to throw open their doors for the ExploreEDU event series, which invites neighboring educators to learn first-hand from their own experiences using Google tools. To see if there’s an event near you, visit the ExploreEDU site. Today’s guest author is Eston Melton, Director of Technology from City Schools of Decatur in Decatur, GA. 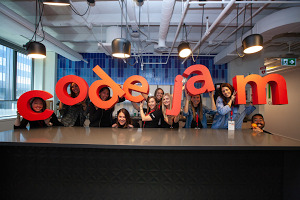 The district hosted an event on February 22 at Google’s Atlanta office with their partner Promevo. Four years ago, our fourth graders were issued one-to-one tablets. As these students approached eighth grade, our middle school’s leadership wanted to transition them to a device that would be easier to maintain while still meeting the requirements of our students’ learning; Chromebooks were identified as the solution. But after we deployed Chromebooks, we realized that we could have expanded the device vetting process district-wide to identify good fits for lower and higher grade levels at the same time. For instance, some elementary schools were keen to add Chromebooks, but needed a different type of Chromebook to fit smaller learners. To help us better anticipate such needs in the future, we’re creating a diverse team of IT staff, teachers, students and parents to standardize how we vet services and devices for all corners of our instructional program. This team will ensure that we can support successful initiatives that others could adopt down the road—not only for devices, but also the critical training and ongoing support needed to get the most from them. Being thoughtful about how files and other materials are shared between students, teachers and administrators is critical. In one of my previous districts, students and staff initially had separate G Suite domains, which meant teachers and students struggled to share materials with each other. We avoided this issue at City Schools of Decatur because we set up both students and staff on a single G Suite domain, and our IT department created G Suite organizational units for staff and students that made setting different levels of permissions easy. That ease of sharing also meant that it was important to train staff on being deliberate with their sharing permissions in Drive. Comfort with Drive has allowed many of our teachers to use Google Classroom to share materials and assignments. Students using Chromebooks for online coursework guided by their teacher in the background. Photo credit: Katie Meyer. We encourage students and teachers to experiment with technology so they can learn what works best for their own styles and needs. 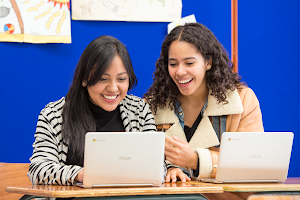 G Suite for Education lets students try new presentation styles by giving them access to collaborative tools such as Sheets and Slides. Students can also reach audiences beyond their peers by sharing their work with the public on channels such as our 3ten Convergence Media’s YouTube channel or our English students’ creative writing Blogger sites. Students aren’t the only ones who experiment—we see staff use Google tools to implement quick improvements in their work as well. For example, when it was time for students to select their courses, our staff recognized that our course selection site featuring static PDFs was not user-friendly. Using Google Sites, our staff was able to rapidly implement several cycles of feedback to create an improved site, made better with an instructional video and cleaner layout. Over the past few years, we’ve learned that technology adoption requires a balance of careful planning and open-mindedness. We believe this mindset is key to our district’s long-term success, and to the success of our students.